Toni Nadal: integral but who? 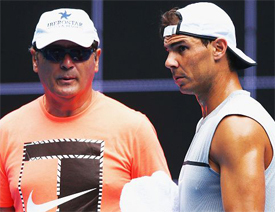 Toni Nadal has been integral in his nephew Rafael Nadal's development and career. But to the outside world he remains an enigmatic figure. This is partly due to his reclusive and protective nature. No doubt he often presents a stern--even intimidating--face to those he doesn't know well. But has the media really ever taken him seriously? The common, slightly dismissive media moniker, "Uncle Toni" belies who Toni Nadal actually is. Those who know him respect his intellect and his integrity and especially his tenacity in helping to build one of the greatest players of all time. First, Toni is a serious student of the game. True, he values his privacy and closely guards secrets he believes have led to Rafa's incredible success. But he is also known to light up in laughter in unguarded private moments—a side of his character the world never sees.